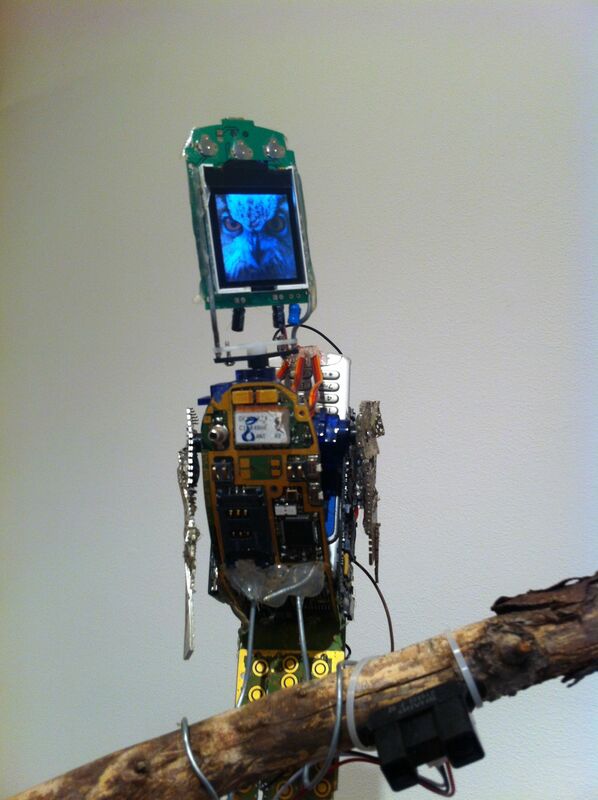 This is a snapshot of personal highlights from ISEA2012 Albuquerque: Machine Wilderness. ISEA (the International Symposium on Electronic Arts) is an international gathering of artists, technologists and crossover types taking place each year in a different location. The 18thsymposium centered on Albuquerque, New Mexico, with offshoots in El Paso, Taos and Santa Fe. This huge event covered multiple sites. Its exhibitions and programme continue to December. The term “machine wilderness” was originally coined by cultural geographer Ronald Horvath in the 1960s to describe the impact of the automobile on the landscape of the American Southwest. 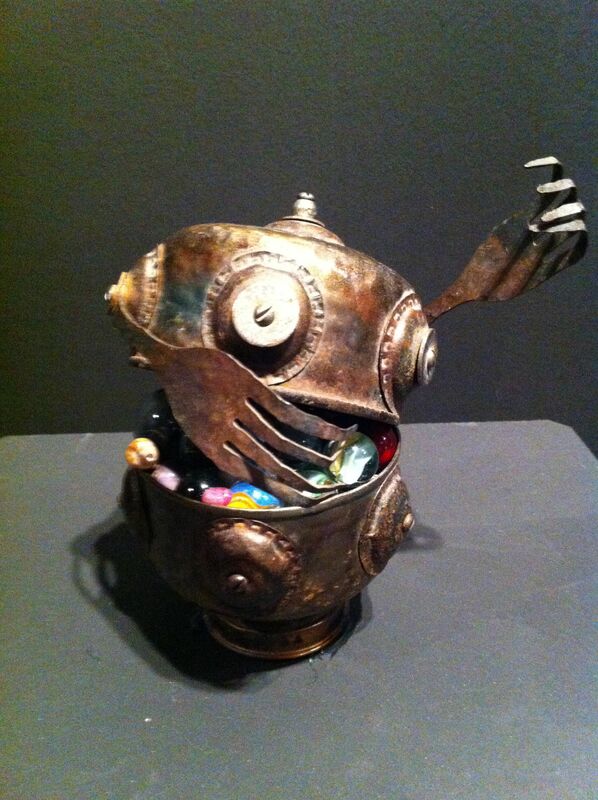 ISEA2012 reclaimed the phrase to represent the co-existence of humans, technology and environment, particularly in the context of New Mexico as a region of technological innovation and experimentation across vast expanses of land, much of it desert or semi-arid. 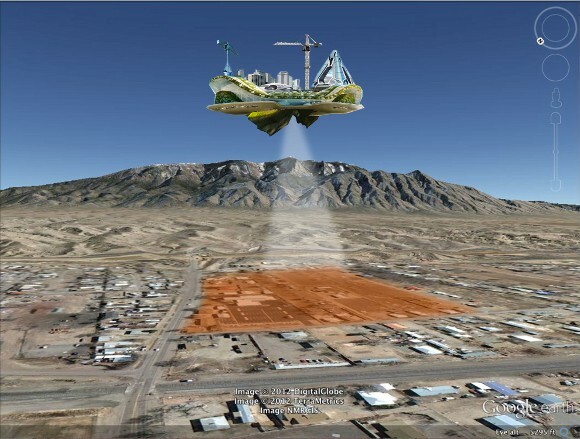 Historically, much of New Mexico’s technological development has been federally funded; the state is home to three air force bases, the White Sands Missile Range, and the federal research laboratories Los Alamos National Laboratory and Sandia National Laboratories. During World War II, the first atomic bombs were designed and manufactured at Los Alamos and the first tested in the White Sands desert. Today, technological innovation continues with injections of private money adding to federal funds, for example, Spaceport America is being built to host Virgin Galactic’s planned space tourism flights. New Mexico is also home to the Very Large Array, a huge radio astronomy observatory consisting of 27 independent antennas. This beautiful and contested technological landscape, many areas being sacred Native American lands, was a fascinating setting for ISEA2012 and the context was reflected in the sub-themes of the conference: The Cosmos, Transportation, Power, Creative Economies and Wildlife. The main ISEA2012 symposium took place from the 19-24 September. It explored the themes through talks, lectures, workshops, performances, exhibitions, film screenings and events. Highlights included archivist Rick Prelinger’s superb home movies-based keynote on the networks that connect us, astronomer Roger Malina’s keynote lecture, which I discussed in the blog post Art in the age of big data, and the Radical Cosmologies panel, also mentioned earlier. The Latin American forum was a highpoint, showcasing many exceptional artists from south of the border. The forum included a lecture by Navajo code talker Bill Toledo. 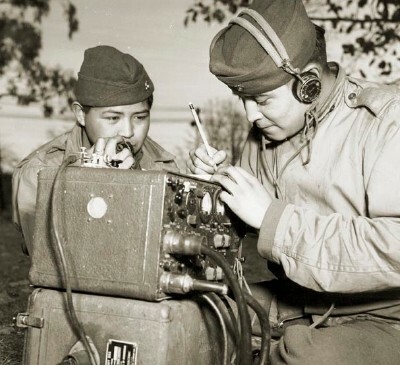 The Navajo code talkers were a small group of young men who transmitted secret communications on the battlefields of World War Two, encrypted in a code created from the ancient language of their people. You can read more here http://www.navajocodetalkers.org/. Here’s a Marine battle hymn sung in Navajo by Bill Toledo recorded by Robert Matney. 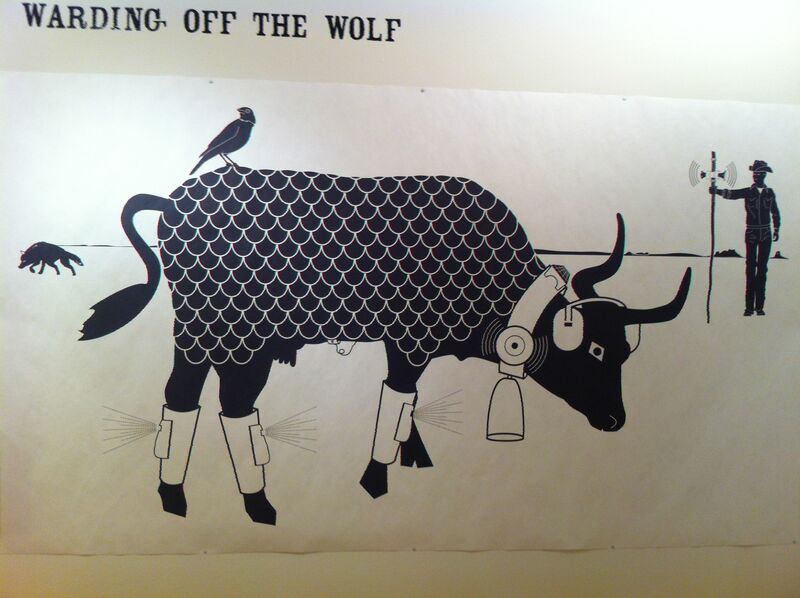 ISEA2012’s exhibitions were spread across several sites, focused on 516 ARTS and the Albuquerque Museum of Art and History. Ivan Puig and Andrés Padilla Domene (Mexico) displayed their SEFT-1 vehicle in the Albuquerque Museum, its activities also appearing in the 516 exhibition. 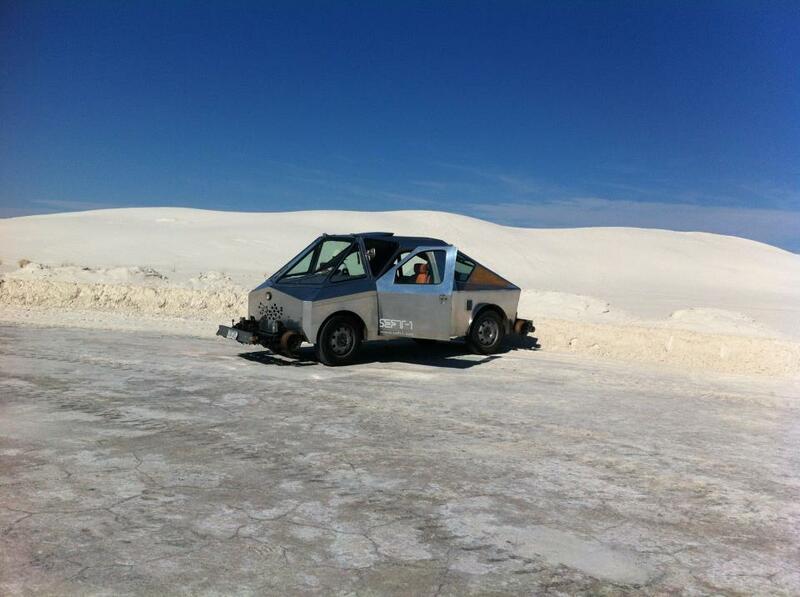 SEFT-1 is a space-age looking vehicle, which travels on roads and abandoned railways to discover remote areas of Mexico. Puig and Domene drove it from Mexico, across the border, where my colleague Rob La Frenais met it in El Paso. Rob and the artists then traveled in it across the New Mexico desert, understandably attracting crowds wherever they stopped. I had fun on Steve Gibson, Justin Love and Jim Olson’s Grand Theft Bicycle. 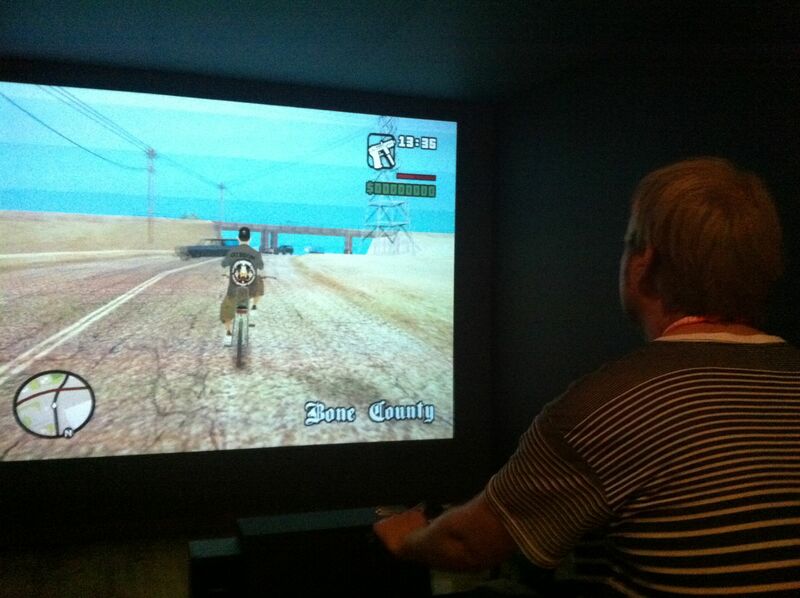 You get on a (real) bicycle and set off, riding through a 3D recreation of a desert city, shooting up the bad guys (well, they might be), leaping over banks to make your escape, and careering into walls – the steering is an art. Hacked from closed source software, it was (apparently) a bit of nightmare to develop. Well worth while. 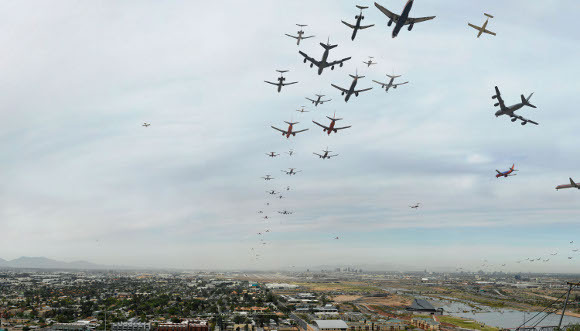 is a digital composite photograph of every airplane flying into Phoenix airport in an hour and a half. Chirping on trees, Neil Mendoza and Anthony Goh’s Escape features moving, tweeting birds, made from disposable unwanted mobile phones. A magical work. ’s impressive The Secret of Eternal Levitation enticed me to build my own “space island”, drawing on water, labour, resources and energy from the Earth (or possibly meteor-mining). Within its sci-fi setting and aesthetic, it made pithy points about the parts of the world we exploit for grand developments of our aspiring culture. 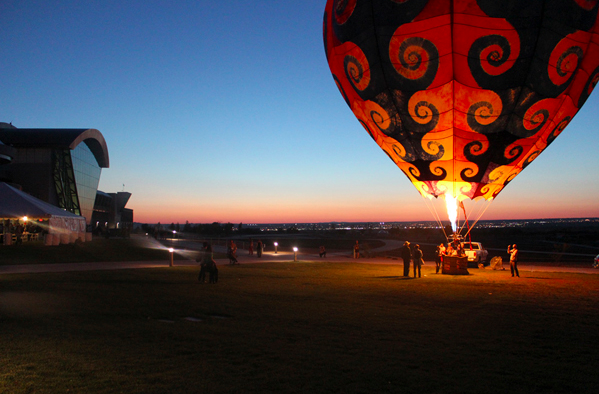 A gala evening for ISEA2012 was held at the eccentric, delightful Anderson-Abruzzo Albuquerque International Balloon Museum (where else in the world could you find a museum devoted to ballooning? ), where delegates watched performances, listened to bands, and saw art installations and exhibits. In a live, interactive performance, Tweets in Space, artists Scott Kildall and Nathaniel Stern sent Twitter messages contributed by participants towards an exoplanet twenty light years away, that might be able to support extraterrestrial life. 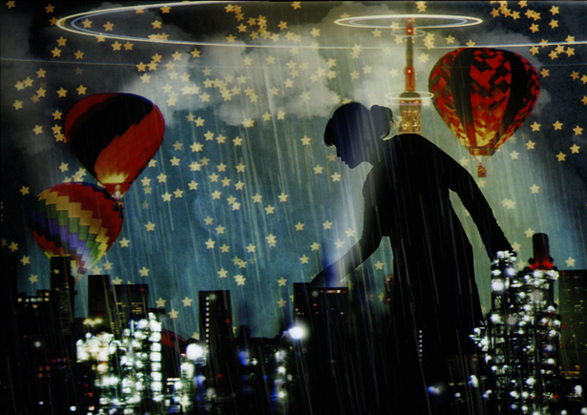 Miwa Matreyekl’s Myth and Infrastructure was a captivating performance combining digital animation and live shadow performance. Also at the balloon museum is an exhibition by Juan José Díaz Infante and the Mexican Space Collective, who are building a satellite called Ulises I. Their installation shows the satellite itself as well as prototype projects by the contributing artists. 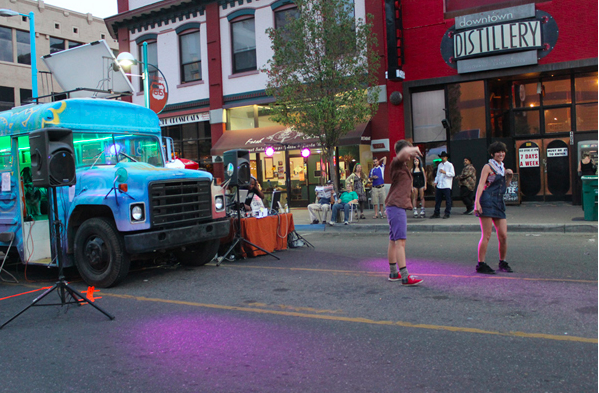 The Albuquerque section of the symposium culminated with a public block party on Central Avenue, better known as the historic Route 66, in downtown Albuquerque. 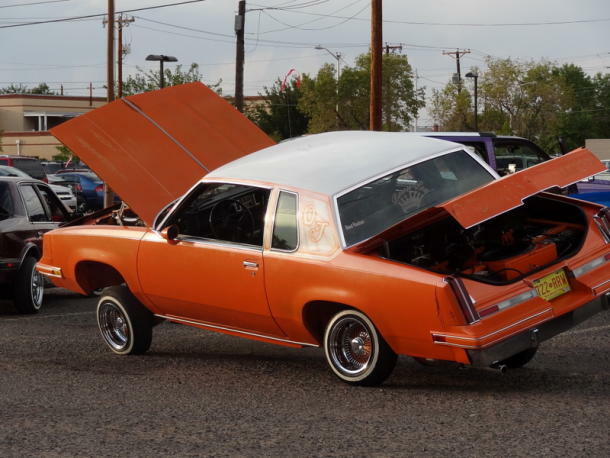 Among the music, installations, street performances, and technological gizmos was a fantastically quirky balletic performance by a jumping, honking, revving gathering of low rider cars. Symphony 505 was a collaboration between the Down Low Car Club and artists Christopher Marianetti and Mary Margaret Moore. 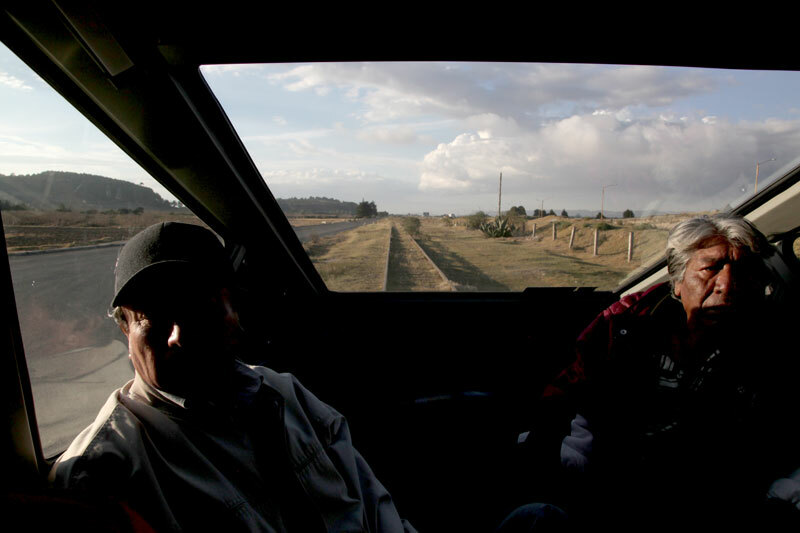 Overall, ISEA2012 was a stimulating combination of electronic art, creative technology, critical discourse, desert landscapes, epic skies, awesome engineering, layered histories, shimmering heat … and those salty, sour margaritas! Thanks for documenting this here. It was pleasant to re-visit my memories of the conference.